Carla came to work for UPIC Health in October of 2017 after working at a nursing home for one and a half years. She’s always had a passion for community involvement, and began a scarf business that sends a portion of the proceeds to countries in need. She agreed to an interview so we could learn more about her business, Y.M. Moda. 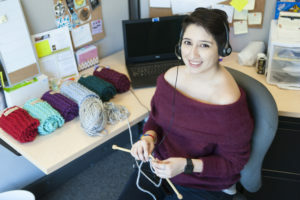 Carla knitting at her desk as she assists patients. Funds from every Y.M. Moda purchase go towards relief projects benefiting Venezuela, Syria and Puerto Rico. What about those countries struck a chord with you? I connected to those countries because I empathize deeply with the struggles of the people of each nation. With seeing each country’s humanitarian crisis, I learned that you could lose everything through no fault of your own, and you’ll only be left with what you have. I’m not there physically, but we are still brothers and sisters. I wanted to help any way I could, because I was able and I knew that there were probably other Americans that felt the same way. In the end, all we have is each other. Scarves are your main project right now- is there any symbolism behind the infinity scarf or any of the colors/patterns you use for your scarves? Not particularly. I just choose patterns and colors that I like and build off of feedback from customers. I started off with scarves because I knew how to knit and it was something cheap that I could produce while I was at my desk, working my current full-time job as a Patient Care Coordinator at UPIC. Do you have any advice for someone looking to start a business that aides their community? Put your weight, faith, and passion in people, not money. If you’re doing the right thing, everything else will follow. Also, like anything else in life, it’s important to surround yourself with people headed in the same direction. It’s clear you are very interested in activism and grassroots efforts to aid communities, where do you see yourself and Y.M. Moda heading in the future? I hope to see Y.M. Moda empowering people anywhere possible. I hope my work helps stir change in communities and people with my products and message. But on a local level, I hope to be able to reconnect and shine light on those around us by featuring local artists, writers, and ethically sourced materials down the line. I still have a long way to go though haha. Y.M. Moda means You Matter Fashion, can you tell us a little about why you chose that name? I wanted every person (the model, the buyer, the benefactors of donations, and even people just encountering the scarf in passing) that came in contact with one of my pieces to feel empowered and to know that their existence matters. It was also important to me to create fashion for regular people like me. Because regular people matter too (you know, since we’re the majority). I wanted to make clothing that made a statement, made you feel great, didn’t hurt or exploit anyone, and didn’t cost a million bucks. What other causes/communities do you find yourself advocating or volunteering for outside of Y.M. Moda? Lately I haven’t been as involved in volunteering as much as I’d like to, but when I do, I mostly hang out at the nursing home I used to work at. It helps me keep things in perspective. Other organizations I’m interested in getting involved with later this year are: Black Lives Matter (D.C Chapter), GreenThinkers (an environmental conservation organization), and N Street Village in Washington, D.C.
How long have you been with UPIC? Has being a patient care coordinator and advocating for patient needs inspired you in any way? I’m going on a year and some change working as a patient care coordinator at UPIC. The experience as a whole and working with the organizations we do has inspired me in some ways and it’s definitely helped put things in perspective. I’ve learned that when you wage stakes for a cause you care about, you have to be ready to fight. Even when you’re attacked from all sides, even when they kick you when you’re down, even when they don’t play fair. You have to keep fighting, if not for you, then for the people you advocate for. While working at UPIC I also learned that individuals have more power than they know. Thinking you’re just one person who can’t make a change is the biggest and saddest lie you can ever believe. Finally, I’ve learned that sometimes, you have to start with ripples to make waves. And sometimes it’s gonna take a few whacks before you get it right. What tips do you have for balancing caring for others and caring for yourself? Make time to reset when you have to, or you’ll always feel overwhelmed and discouraged. Get a planner. If you refuse to sit still, structure is needed. You’re not superman. Don’t be afraid to deal with what you feel, its necessary for growth. And most important: Make sure you’re okay. If you’re not good, you can’t help anyone else. How long have you been knitting? Do you have any plans to expand your line to include other items? Also, Yes! I do! I’d like to venture into making other women’s clothing, jewelry, and accessories. Little by little though, but stay tuned! Information about Y.M. Moda can be found on the website and Instagram.